If you search your ancestors in Pontelandolfo, Campania, info about your Italian family are stored in the City Office archives or at the parishes. In towns and villages of Campania and in Benevento province registry offices were established in early 1800: it means that you could find information in Pontelandolfo registrar as of that date. So, if your ancestors were in Pontelandolfo in the nineteenth or twentieth century, then you could try to contact the City Office of Pontelandolfo to know more. Before to start your genealogy research in Pontelandolfo, we suggest you to read our tips for your search . They are useful to search in Campania and in Pontelandolfo too. 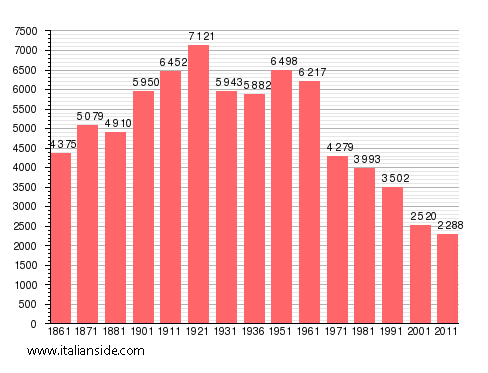 Next picture shows the demographic trends in Pontelandolfo from the Italian Unification (1861) an important info to understand how many people lived there in the past. It could be important to know if the last name you are investigating is a frequent surname in Pontelandolfo. As more your surname is common in Pontelandolfo, as more it could be difficult to find the right info about your ancestors in Pontelandolfo archives if you have not exact dates. Barbato, Calabrese, Caporaso, Caruso, Ciervo, Cocca, Colangelo, Corbo, D’Agostino, D’Andrea, De Ieso, De Luca, De Rosa, Del Grosso, Del Vecchio, D’Onofrio, Esposito, Falzarano, Fusco, Garofano, Grasso, Iadanza, Iannotta, Izzo, Leone, Lepore, Lombardi, Maio, Mancini, Massaro, Mercurio, Nardone, Pacelli, Palumbo, Parente, Pastore, Pedicini, Pepe, Ricci, Ricciardi, Riccio, Romano, Rossi, Ruggiero, Russo, Varricchio, Zollo, Zotti. Church archives in Benevento province may instead contain even older information, but they are far less accessible from abroad (and almost impossible by email). Then,parishes send information not easily. If you have the opportunity to visit Pontelandolfo and Benevento province, you could plan to investigate churches’ archives by yourself, but from abroad is very difficult to obtain any result unless you find a reliable local help. If your research is in a dead end and you need professional help from our local Italian genealogists write to pontelandolfo@italianside.com our expert in Pontelandolfo area will study your request and will reply to you with a research plan and a quote. Hi! My ancestors was from Pontelandolfo. My Great grandfather’s name was Giovanni Guerrera. He was born 22.2.1873. His father was Donato and his mather was Lucia Guerrera born Mancino or Mancini. He went in Brasil. Everyone else may have stayed in Pontelandolfo Italy. My grandfather was nicholas Orsini..He came to U.S.A. aprrox.in 1910..was born approx. 1894. Landed in Waterbury CT. He said his family owned a farm. He met my grandmother and her family name is Santipietro. I’m trying to find any information about my grandmother. Her name is Marietta Guerrera. She was born on February 9, 1900 in Pontelandolfo She came to Ellis island in america in 1920 Her father was saverio Guerrera born in pontelandolfo. Her mother was Theresa Alteri born in Mercone. thanks for any info . Cousin!!! I have a Salvatore Maffei in my records who was born in 1883! He’s my 1st Cousin 3x removed. Although I can’t yet confirm that this is the same exact person as your grandfather, and I don’t have his mother’s information, I do have his father, grandparents, and great-grandparents names! Dear Sir: Five cousins will stay in a villa a mile outside Pontalandolfo Sept 24,25,26 . I hope to hear from you as soon as possible …We fly on September 18 to Venice from the US. My father Anthony Rinaldi is the son of Giovanni Rinaldi Matteo MAY 1, 1880 who married Vittoria Rinaldi (cousin) also of Pontalandolfo. They were m married on She is the daughter of Guiseppe Rinaldi and Filomena Gugliotti Born Dec 9,1878. Their first son Michelangelo was born on December 19, 1901 , the only child not born in Conn.. None died in Italy. . They had 11 children Maria Vittoria is the daughter of Giovanni Pesce and Maria Agnese Ciarlo. siblings were Salvatore Rinaldi 1875-1953, Rafaela 1884-1960, Antonia , Nicola 1917 and , Concetta. My grandfather had 2 brothers -Salvatore Rinaldi and Mateo Rinaldi. I have a picture of the Rinaldi house which someone in Agriturisim showed to my cousin ten years ago. I would like the address. I can send the photo along with printed research that is more reliable than this . I would like to have information in Italian and English about other possible relatives there now. Also, I believe there is a relative buried in the cemetery who was a veteran of the first world war. Another uncle Frederick, who landed at Anzio in ww2, came to the village during the war and brought food tothe people of Pontelandolfo. He helped two cousins emigrate to Canada. 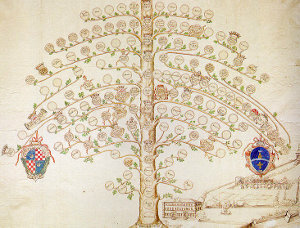 In the recent computer material they showed a young man named Rinaldi who does genealogy. Does he work with you? I can read and speak some Italian. Please answer so that I can continue to communicate with you. My great Grandfather is Salvatore Rinaldi. He married Maria Guerrero but I can’t find parents names or information about their families. My grandfather Angelo Rinaldi had several brothers, Louis, Carmin, Anthony and Sisters Grace and Anna. I know Louis came to Waterbury Ct after Angelo and married Pauline. Angelo Married Mae Louise Pierro . I just read your message. I know who your grandfather is. I grew up calling him Uncle Angelo although he really wasn’t my uncle. It was a term of respect. father is Antonio Rinaldi and I believe is a cousin of your grandfather. I also know who Pauline and Louis are. Everyone were friends throughout the years.. Your grandfather made beautiful baskets and I still have one of his baskets. I don’t know what I can help you with but I do have some info on the family. I have been to Pontelandolfo several times. My cousins still live there. take care. Hope to hear from you. My Grandfather was born 27 May 1890 in Potelandolfo, Italy. He went by the name Mike Meton when he immigrated to the United States. In the earliest record I can find for him on this side of the Ocean his name was listed as Mike Mortoni. I think that may not be his actual Italian name. His marriage record here says his Father’s name was Leonard or Leranrado Meton and his mother’s name is stated as Coneatta Santohietra. I would like to get a copy of his birth record. Could someone give me an idea of how to go about that? Perhaps his mother’s name would be helpful in locating his birth record and his Italian name. Thanks for any help you can offer. Just reading your post .. I suggest you research Concetta Santopietra(o) vs the Coneatta Santohietra. Santopietro is a common surname in Pontelandolfo. Maybe surname Mancini vs Mortoni. My Great Grabdfather, Orazio Mucciacciaro, immigrated to the US in the early 1900’s from Pontelandolfo. I’m searching for some way to see my lineage tree and possiblencontact family that I didn’t know I even had. Has anyone successfully located any type of family tree or more information regarding their lineage, and if so how did you go about it? I’m in the process of collecting documents to apply for citizenship jure sanguinis (Mother –> Grandfather –> Great-Grandfather). But I need to get the birth certificate for my great-grandfather, Raffaele Pesce, who was from Pontelandolfo (we actually have a copy, but my mom wants to keep the original!!). I tried emailing an address provided on the commune website, but never heard back. Should I try writing a letter? Or is it really only possible to obtain documents in person or through an agency? Looking for any relatives of Nicholas Rinaldi born 1883-1978 married to Carmella Longo born 1889-1992. One of six children born to Nicholas and Carmella in Pontelandolfo, daughter Antionette born in 1914-2016. Five more born in East Hartford CT….Mary 1916, John 1919, Angelina 1921, Rose 1925, all deceased. Philomena 1929 , living. Nicholas and Carmella and daughter Antionette emigrated to the US in 1915 but no records exist at Ellis Island..may have been stowaways. We travelled to Benevento in 2010 but was unable to navigate because of language barriers. Planning another trip there possibly in 2017 and would like to know EXACTLY where to go to find this information and any existing family members still living in the area. My wife Linda is daughter of Philomena (Rinaldi) Ballard. Mother has no knowledge of family heritage. My father was born Salvatore Calabrese in Pontelandolfo in 1899 . I believe his father’s name was Nicola Calabrese and Mother Angela Santopietro where can we find their birth, marriage and death records along with their parents that would bring them to dates before the 1861 massacre? If you would like to start a research in Pontelandolfo please send your request to pontelandolfo@italianside.com.